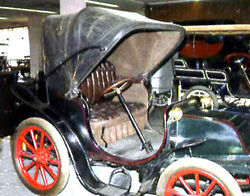 STAE (Kriéger Società Italiana Automobili) was established in May 1905, in Turin, to build and distribute, under license from the French company Kriéger, an gasoline-electric cars. Two years later due to disagreements with the contract and the Kriéger company was terminated and STAE founded. The company was in business until 1913. The production of the company focused on the construction of cars with 5hp motors with a Tudor accumulator, with a 3-speed transmission plus a reverse.